Steel and Tools are delivered using different methods and cannot be combined. When ordering steel and tools their delivery costs will be calculated independent of each other. Therefore you will incur two sets of delivery costs when ordering steel and tools. 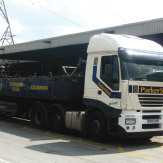 Here at Parkers, we understand that our customers want a fast, efficient delivery service. 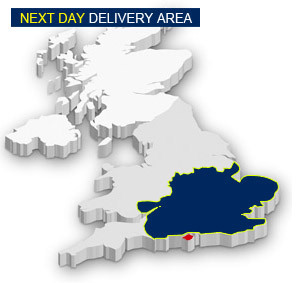 We are proud to offer an unbeatable next working day delivery service on all our stock lines. All Steel stock ordered and cleared before 6 p.m. will be delivered next working day using our own dedicated fleet. A charge may be applied if your delivery falls under a difficult delivery area ie: Central London / Isle of Wight etc. Please check your order summary after completing your order. We deliver to the Isle of Wight every Wednesday. Our standard method of delivery, subject to sufficient stock availability, orders taken before 5 p.m. between Monday & Friday are despatched the same day. Orders taken Saturday or Sunday are despatched the following Monday. Weekends or bank holidays are despatched the next working day. 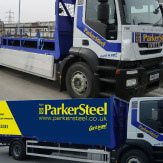 ParkerSteel has an impressive 60 strong fleet of purpose built vehicles and artic trailers Our range of vehicles means we are capable of catering for any size delivery. Due to the innovative design of our vehicles, your material will arrive in perfect condition. Each of these vehicle measures 9m in length and can carry up to 8.5 tonnes of material. What makes this vehile special is how it can carry a variety of material in their own separate areas which minimises any risk of damage. Each body incorporates a specific covered tubing and non-ferrous section which ensures the material is delivered in perfect condition. Our trombone trailers can expand to a whopping 18m. 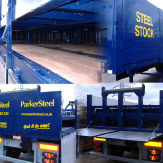 These extended trailers are capable of carrying 22m long steel beams. 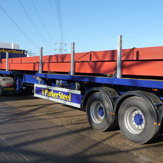 The sheer length of this vehicle enables extra large beams to be transported across the UK and is ideal for use the in construction industry. It is the Customer&apos;s responsibility to offload the Goods at the Delivery Point in a safe manner and to provide, free of charge, adequate labour and equipment for this purpose. Our vehicles do not come equipped with lifting equipment and our drivers are only employed to deliver goods. Although the load has been checked for accuracy of orders and stability of load, the recipient must complete a further check before starting the offloading process, as the load may have moved during transit.